Postmodernism is modish (no conundrum intended). It is also ambiguous. On the one hand, deconstructive postmodernism claims that all religious and philosophical worldviews are fabricated to justify the power of a dominant élite. None is true. And a person's preference for and loyalty to this one or that depends on how well it serves his or her interests. Deconstructive postmodernism is both nihilistic and cynical. On the other hand, reconstructive postmodernism is creative and optimistic. It aims to clear away the rubble and rubbish of the dilapidated modern worldview founded on now-defunct modern classical science, and, in its stead, to rebuild from foundations constituted by the "new physics" (relativity and quantum theory) and the "new biology" (the theory of evolution and ecology). Modern natural philosophy—essentially, classical mechanics—has been overturned by the new physics. Everything else modern—the social contract between egoistic social atoms, economic reductionism (including both capitalism and anticapitalistic Marxism), preference utilitarianism, and so on—which has orbited about modern natural philosophy has been left without a center. Because reconstructive postmodernists can't be quite sure what modernity's successor will turn out to be, they remain cautious and call this interregnum "postmodernism," while they wait for "organicism," or "systems theory," or some such label to take hold. 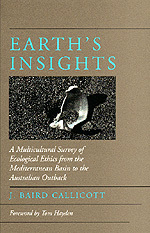 In 1989, the ecofeminist philosopher Jim Cheney took a deconstructive "postmodern turn" in the field of environmental philosophy and ethics. 1 According to Cheney, with the "demise of modernism" there has occurred a "shattering into a world of difference, the postmodern world." 2 No reconstruction is possible, in his opinion, since Cartesian certainty is most certainly unobtainable and the underlying political agenda of all intellectual constructs has been exposed. And further, no reconstruction is desirable, since any comprehensive worldview represents a "totalizing" package of concepts which would "colonize" other systems of thought. Deconstructive postmodernists are content to deconstruct the old texts and declare that there will be no new master narratives, no new New Organons, Meditations, or Principias to set the course for generations to come. As this book consists of a global sampler of traditional and indigenous environmental attitudes and values, one might expect it to close with a resounding endorsement of deconstructive postmodernism and the pluralism it implies. Certainly this book recognizes and celebrates cultural diversity and intellectual pluralism. But untempered pluralism, especially if harnessed to deconstructive postmodernism, courts conflict rather than mutual understanding and cooperation. The endpoint of untempered "claims of otherness and an ethic of difference," so warmly endorsed by Cheney, is the violent ethnic conflict now plaguing the world. 3 A unity and harmony in multiplicity must be achieved, if our common environmental crisis is to be cooperatively—and successfully—addressed. What is needed is a Rosetta stone of environmental philosophy to translate one indigenous environmental ethic into another, if we are to avoid balkanizing environmental philosophy. Or, to continue shifting metaphors, we need a conductor's score in addition to charts for all the individual players, if we are to orchestrate effectively all the world's voices singing of a human harmony with nature. Biological diversity is a good thing. So is cultural diversity. They are, moreover, intimately linked. Cultural diversity is a reflection of biological diversity, a fact more clearly recognized by tribal totemism than by contemporary social science. The same forces—transnational corporations, Green Revolution agriculture, and a global market, among others—driving cultural homogenization and impoverishment also drive biological homogenization and impoverishment. And the conservation of cultural diversity is instrumental in the conservation of biological diversity. Since the life-ways of foragers and vernacular agriculturalists are so thoroughly integrated into their local biotic communities, culture conservation is tantamount to biological conservation. The myriads of species that make up biological diversity do not, however, exist in isolation from one another. Each is integrated into an ecosystem. How, analogously, might we unite the environmental ethics of the world's many cultures into a systemic whole? That is the principal task for this penultimate chapter. The ecofeminist philosopher Karen Warren has suggested an appropriately feminine metaphor for the union—or "solidarity," more precisely—of diverse ecofeminist "voices": a patchwork quilt. 4 But the colors in a patchwork quilt may clash, and the whole will then have no systemic integration or integrity. A patternless patchwork quilt is a poor analogue of an ecosystem. We want a genuine multicultural network of environmental ethics, rather than an eclectic and conflictive patchwork. Hence the "postmodernism" of this chapter's title is of the reconstructive sort. And the evolutionary-ecological environmental ethic founded on such a postmodernism is intended to embrace and unite, as well as complement, the traditional and indigenous environmental ethics so far reviewed. We must be keenly aware of human differences, and we must defend cultural diversity as ardently as we defend biological diversity. But we must also be aware of what unites the world's diverse cultures, no less keenly than we are aware of the ecological relationships binding the myriads of species into hierarchically nested ecosystems. An oft-repeated refrain of this study has been that there is one species of Homo but many peoples; one planet but many worlds. The modern scientific worldview, however, has partly unified the planet intellectually, making it—to some extent—one world as well as one planet. Science is Western in provenance, as the historical sketch in the next section of this chapter suggests, but science is now also international in practice and influence. The modern scientific worldview has become a cognitive lingua franca. It coexists and often insidiously intermingles with the many and diverse traditional cultural worlds. Thus, it is one of the ties that unite them. We all live in distinct bioregions, each with its characteristic climate, topography, flora, and fauna. But the shores of all continents and islands are washed by one ocean, and we all inhale one atmosphere. Similarly, we all inhabit distinct traditional cultural worlds, each with its characteristic ontology, epistemology, cosmology, aesthetics, and ethics. But, for better or worse, Western ideas have become a pervasive cognitive ether that nearly everyone breathes in—more or less deeply. The curricula of secondary schools and universities from China to Brazil and from Tanzania to Canada include standard biology, physics, and chemistry along with indigenous culture studies. Further, the hardware icons of the modern Western scientific worldview are ubiquitous. And they invade the most intimate aspects of the lives of all but the most remote and isolated of the earth's peoples. Airplanes fly over the Kalahari Desert; Land Rovers crisscross the Serengeti Plain; chain saws buzz in the forests of Borneo; snowmobiles ply the frozen Yukon; diesel-powered ships anchor off remote Pitcairn Island; hydroelectric impoundments flood vast reaches of the Amazon Basin. Machines, no matter in what cultural context they may be found and no matter what traditional agendas they may be employed to serve, are microcosms of the Newtonian macrocosm. They embody the modern scientific paradigm, and constantly, remorselessly reiterate and validate it. Vaccinations put the stamp of the modern scientific worldview on the shoulders of infants in Africa; intrauterine birth-control devices insert the modern scientific worldview into the wombs of women in India; when the Shining Path guerrillas of Peru grasp AK-47 assault rifles, they grasp the modern scientific worldview. When such technologies as these "work," they confirm the "truth" and the power of the ideas that engendered them and which they manifest. The irony, of course, is that, theoretically speaking, the "modern" scientific paradigm is now obsolete. A new postmodern natural philosophy has been taking shape during the whole of the twentieth century. From a postmodern scientific point of view, the mechanico-industrial transmogrification of nature appears to be a grotesque and dangerous outrage, requiring us to develop an environmental ethic to temper its effects. And while the modern Western worldview and its associated values represent a hostile intellectual climate for the development of a direct or nonanthropocentric environmental ethic, the emerging postmodern paradigm promises to be much more hospitable to such an enterprise. The central section of this chapter is devoted, therefore, to the construction of a postmodern evolutionary and ecological environmental ethic, which is offered both as a complement to and a touchstone for the indigenous environmental ethics sketched in the preceding chapters. How, more precisely, is the postmodern evolutionary-ecological environmental ethic here constructed related to the foregoing traditional and indigenous environmental ethics? What exactly do "complement" and especially "touchstone" mean? The "land ethic" developed in this chapter is a sister to those in the preceding chapters. But it is more than that. It is not just one option among many, standing alongside, say, the Jain ahimsa environmental ethic, and appealing only to members of a specific sect or culture. It is a sister environmental ethic, but it is also proffered as a universal environmental ethic, with globally acceptable credentials, underwriting and reinforcing each of the others. Further, it is also intended to serve as a standard for evaluating the others. Mindful of Jim Cheney's condemnation of totalizing and colonizing discourse, one might well wonder if such claims on behalf of the land ethic were not an arrogant assertion of philosophical imperialism, a bid for intellectual hegemony. Notice that throughout this book an evolutionary and ecological worldview has implicitly served as a standard for evaluating the environmental attitudes and values associated with traditional cultural worldviews. For example, in chapter 3, Hindu substantive holism was found to be a problematic basis for environmental ethics, because it differed significantly from the systemic holism characteristic of ecology. For another example, in chapter 6, the woodland American Indian concept of multispecies socioeconomic exchanges was touted, because it was, abstractly speaking, identical to the ecological concept of a biotic community, which is foundational to the Leopold land ethic. The implicit normative appeal to an evolutionary-ecological worldview and its associated environmental ethic may here and now be explicitly acknowledged. But is such an appeal warranted? Can it be justified? Since science is Western in provenance, one cannot pretend that a scientifically grounded environmental ethic is culture-neutral. But science is now practiced internationally, with only the slightest culture-specific variations from nation to nation. These variations are so slight, in fact, that expressions like "Japanese science" or "Indian science" refer not to different and mutually unintelligible species of thought but to the international science going on in Japan or India, largely untouched by Shintoism or Hinduism. One can fairly assert that at least the ever-evolving scientific worldview enjoys genuine international currency. J. Baird Callicott is Professor of Philosophy and Religion Studies at the Institute of Applied Sciences, University of North Texas, and author of In Defense of the Land Ethic: Essays in Environmental Philosophy (1989).